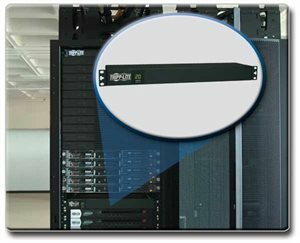 Do you need an efficient, cost-effective way to distribute and monitor power in an IT or industrial environment? Tripp Lite's PDUMH20 Metered Power Distribution Unit is the solution you seek! It provides 12 outlets plus a digital meter that displays continuous power consumption, enabling IT personnel to monitor the PDU's load on site. The PDUMH20 features an all-metal housing and a switchless design to prevent accidental shutoff. It is suitable for 1U or 0U (vertical) rackmount installation as well as wall-mount, workbench, under-counter and similar installations. The PDUMH20 comes with a 2-year warranty. The PDUMH20 is designed for reliable distribution of AC power to supported equipment in IT, industrial and similar applications. It features a rugged all-metal case, high-quality outlets, a 20A circuit breaker and a switchless design to prevent accidental shutoff. A TVSS grounding lug provides added grounding security and safety. Unfiltered electrical pass-through makes the PDUMH20 ideal for distributing alternate waveform utility, UPS or generator power in rack enclosures, network closets, and more. It provides 12 5-15/20R outlets and a 15-ft. cord with a locking L5-20P plug (5-20P adapter included) to prevent accidental disconnection. With only 4.5 inch depth, the PDUMH20 is easy to integrate with a wide range of network, industrial and other applications. It is suitable for 1U installation in standard rack enclosures as well as wall-mount, workbench, under-counter and similar installations. The PDUMH20's switchless design prevents accidental shutoff and safeguards against downtime due to human error. Ensure proper load balance with the PDUMH20's digital LED meter that displays the total connected equipment load. This meter enables IT personnel to monitor the total load on the PDU in real time, allowing more equipment to be safely connected with no danger of overloading the PDU or power supply circuits. This helps to ensure proper load balance in complex redundant power applications and avoid costly overloads. The PDUMH20 is backed by a 2-year warranty. As part of Tripp Lite's commitment to environmental responsibility, it is manufactured in compliance with strict RoHS specifications.